After the run, stay to enjoy a free breakfast from the Original Joe's Heart Cart, a silent auction with amazing items donated from all local vendors, face painting, bouncy castle and more! For the person/team that raises the most money in donations, a $250 prepaid visa will be awarded! Please remember all donations made over $25 will receive a tax receipt from the Stollery Children's Hospital. * Teams must have a minimum of 6 members and 10 maximum. After 6 members, each member has to pay addtional member fee. Children under 2 can enter for free but they don't get a t-shirt. 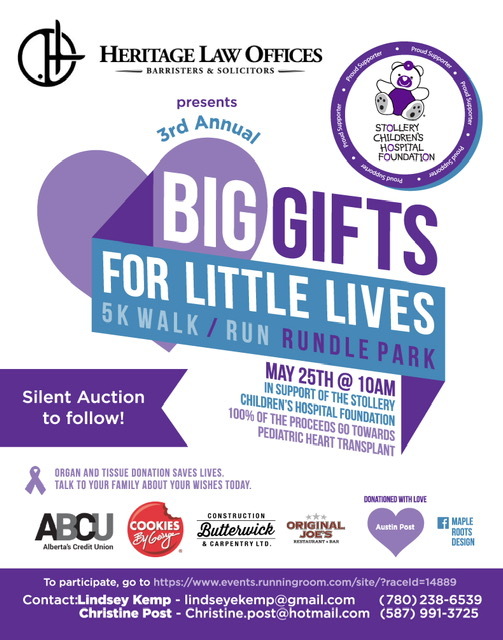 Big Gifts for Little Lives 5k Walk-Run is a 5k run/walk held in support of the Stollery Children's Hospital in Edmonton. 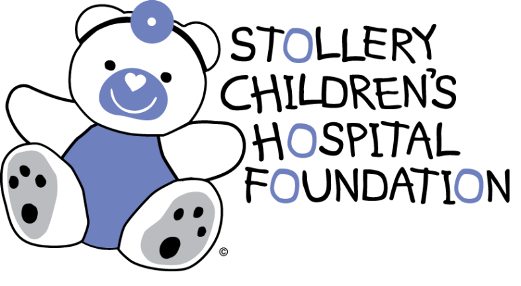 The Stollery Children's Hospital Foundation will give the sickest kids the best chance, anywhere in the world, to live a long and healthy life. 100% of proceeds goes towards Pediatric Heart Transplant research. 5k Walk/Run @ 10:00 A.M.